Invites are going out for a Google event in San Francisco, Calif. next Wednesday, July 24. 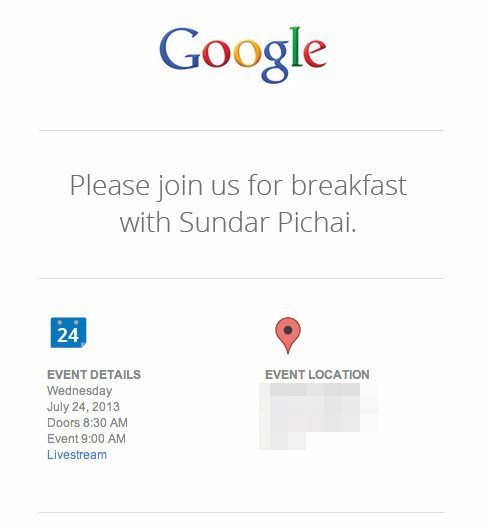 Dubbed "breakfast with Sundar Pichai," the event will likely cover new developments in Android or Chrome, the two product areas Pichai now oversees. The event will also be livestreamed on YouTube for those who can't be there. On the Android side, we're expecting the arrival of a new OS version — version 4.3 — and possibly a new ASUS-built Nexus tablet along with it. There's also the possibility that the newly-Googlified Motorola could drop in to show off its new Moto X handset. Whatever happens, we'll be live from San Francisco next Wednesday to bring you full coverage.